Many period properties have alcoves on either side of the chimney breast, and even the smallest can accommodate built-in storage. Many people opt for fitted cupboards with shelves above, but if space is tight you could go for shelves alone. There are all sorts of different styles and finishes so you can create a bespoke design that fits your taste and the age of your home, and they provide a very handy way to hide clutter or display books and treasured objects. And if you want to use fitted alcove furniture as a media unit, you can incorporate open shelves for DVD players and set-top boxes, as well as cable-management tricks to hide wires and leads from view. 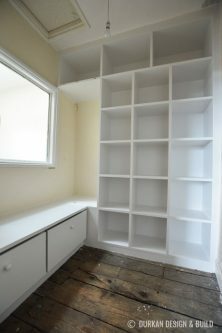 Read more about built-in alcove cupboards here. Shelving has been wrapped around all three sides of the recess in this Bristol apartment, creating lots of handy storage and display space in a previously unused corner of the living room. You can also use fitted furniture to transform fireplaces themselves. If you have an empty hearth, how about installing shelving or even a little built-in seat? This can give dead spaces a new lease of life and create a much-needed focal point in a key area of the room. Built-in cupboards are the obvious choice for understairs areas, and they’re certainly a great way to squeeze extra storage into your home. But they’re by no means the only option. If you need an office space or somewhere for the kids do their homework, how about a built-in desk? Fitted shoe racks can also come in very handy, especially in hallways. 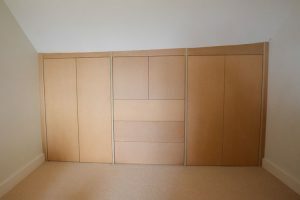 Don’t assume you can’t have fitted wardrobes if your bedroom has a sloping ceiling or is squeezed into the eaves – very common in period properties and loft conversions. We can create made-to-measure designs to fit any attic space, maximising storage by using every available inch – you can find out more here. The void beneath a sloping ceiling can also provide an excellent spot for a built-in bed – a great way to make the most of space in children’s bedrooms or guest rooms. What’s more, there’s plenty of scope for adding useful storage drawers underneath. A wonky, sloping ceiling was no barrier to adding fitted wardrobes in this attic bedroom. The bespoke design features a mix of cupboards and drawers and was tailored to fit the awkward space. The popularity of loft conversions means many homes also have dormer windows with hard-to-use space underneath. One way to make the most of them is by installing a built-in window seat, perhaps with a cupboard or storage space below a lift-up lid. This not only creates a great place to stow away blankets, bedding and the like, it also provides a comfy spot where you can put your feet up with a cuppa and gaze at the view. A floor-to-ceiling bookcase makes the most of every cm of wall space in this box room. The space beneath the window has been turned into a seating area incorporating useful storage drawers. Don’t write off corners that are too small for traditional furniture, as you could turn them into eye-catching displays. 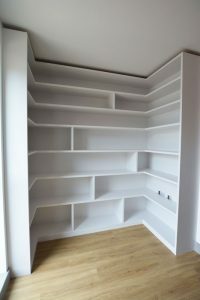 Bespoke shelving can be tailored to fit any space, and even wrapped around the walls. Display boxes, fitted desks and custom-made media units can all be incorporated, too. A floating desk in solid oak and black Valchromat creates a handy workspace in this once-empty corner. Wraparound shelving above provides an eye-catching way to organise books and files. 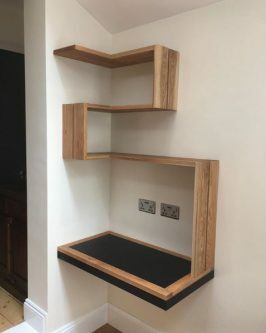 If you live in Bristol or the surrounding area and you want to discuss how bespoke fitted furniture could transform an unused corner of your home, just call us for a chat. We’ll arrange a free visit to discuss your ideas, before providing a no-obligation quote. If you live in Bristol or the surrounding area and you want to discuss how to improve your home with made-to-measure furniture, please call us for a chat. We will arrange an initial site visit to discuss your ideas and requirements, before providing a no-obligation quote.